When will it end? Heavy 8, Heavy 9, Heavy 10. Do they have Heavy 11? 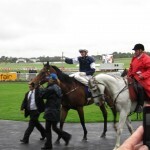 Sandown in the wet – a punter’s graveyard. I was an early scratching. A definite no show. 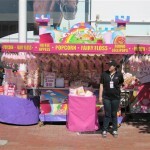 The carnival is over and at last, a beautiful spring day in Melbourne, sunny skies, and a dry track. A day to be savoured. Warm bones, spring in my step, beautiful horses to look at, things back to normal. I get there an hour early to allow plenty of time to wander around the stalls. Immediately my attention is drawn to a three-year-old colt braying in his stall. Restless, pawing, neighing, clearly full of testosterone. 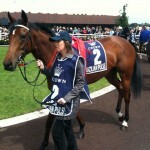 Typeface, the favourite in the first. I cross him out and he’s not even saddled up yet! His manner doesn’t improve much in the mounting yard, mouth wide open, head twisted, gaping and lolling his tongue in resentment at the tongue tie, two strappers to control him. I decide to lay him on Betfair although they are jumping out of trees to back him with the books. To my mind, he’s too much of a risk. And sure enough that’s how he runs. Misses the kick, gets caught up in traffic, can’t win at the 400 mark, and then suddenly just bursts through to blitz them on the line. I suppose I’ve relearnt a life lesson. A lesson I’ve learnt many times before – three-year-old males are the class of horse I have most trouble with. If Typeface had been a mare he would have been history. 3YO colts! Danger! Their testosterone-fuelled behaviour, as well as being their downfall, can often be their saviour! My day didn’t improve much after that. I liked Straveen in the mares race with a nice positive strapper, but she was blocked on the inside and didn’t get a run at them. I got some back with Tio Rossa in the seventh, but then gave it back on Netra, who ran out of puff after leading them up in the last. So one out of four for a pretty ordinary day. But I did have a nice conversation with Peter Strafford, the race day farrier, who has spent forty years working in the danger zone. He’s not allowed to bet on the horses unlike others in the industry. Trainers can bet and apparently some jockeys like Blake Shinn can have a go too. But not farriers working at the pointy end. I got to tell him my favourite horse anecdote. It’s a definition of the horse by Ian Fleming, the author of the James bond books: “Dangerous at both ends, and uncomfortable in the middle”. I’m preparing a list of questions for him. Do I need to look at a horse’s feet and record all that stuff: shock-shod shoes, glue-on shoes, bar plates and tips? We’ll see. Barry at the horse gate noticed my slumped posture and enquired after my well-being. I told him I was down and he said “You can’t expect to win every day, Doc”. The trouble is – I do. The forecast is not good. Rain, rain and more rain. And the train line is down with a replacement bus between Oakleigh and Springvale. And the track is deteriorating from a Slow 7 to Heavy 8 and finally, Heavy 9. Help! I suppose I could moan on about how miserable a spring it has been, but really, Zipping has been the standout. 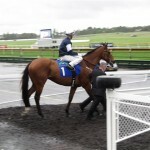 My favourite horse and I didn’t have a penny on him. The $1.10 for the place on the tote today was a bit tight, but three late scratchings meant there were still three place dividends, despite the five horse field. Nine years old and four Sandown Classics. What odds on next year? 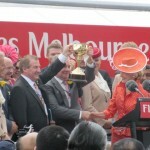 Another Australian Cup? 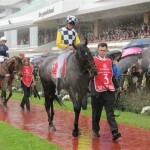 Another Cox Plate placing, another Cup fourth, and a fifth Classic? Who knows. What a horse! At last, a decent day and a dry track. 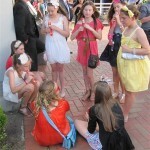 Stakes Day, Family Day, Kids Day, Final Day. 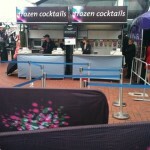 The frozen cocktail bar has gone and in its place is a lolly shop! I don’t mind all the rugrats for one day in the year. 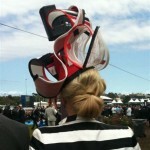 We need to train the next generation of punters and fashionistas and initiate them when they are young. I even tripped over some slurping on my old favourite, the Slippery Sam. It’s been a miserable carnival and I finish it off in a miserable way. 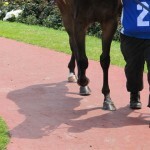 I tried to photograph Hay List’s leg wound, but failed dismally when it was obscured by shadows. 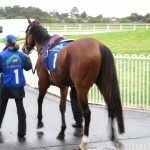 And I thought Drumbeats looked very solid in the main race, but he never looked likely and finished sixth. 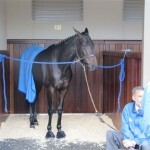 And I was quite taken with the appearance of the Godolphin horse in the Queen’s Cup, nearly asleep in her stall. And some special treatment with wood shavings for bedding. Her mane had been plaited, which I normally deduct marks for, as it suggests a show pony and a strapper’s horse rather than a racehorse. But because it was a mare I was forgiving. 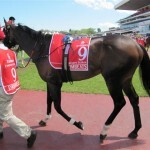 Eastern Aria finished an average seventh. So two bets for two losses to round out a very average week, and a modest profit over the carnival. There’s an icy-cold southeasterly blowing, so not much business at the frozen cocktail stall. We’re already frozen. In fact, we’re all a bit tired of the cold and wet. The most common fashion accessory? Not hats or tatts – goosebumps. The track is rated a Heavy 8, but I would describe it as a Shifty Slow 6. Too shifty to bet. 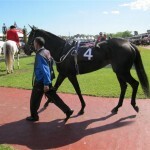 The Oaks winner, Brazilian Pulse, was the most relaxed looking horse in the race, just lobbing around in the parade ring and mounting yard, interested, nicely pricked ears. It’s frustrating. I’m saving my money for Stakes Day. The weather must pick up soon, mustn’t it? 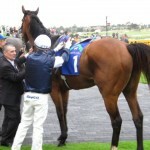 I take up my position on the mounting yard rail at 2.15 pm. A 45 minute wait. Shocking looks good, but still not as fine as last year, and The Champ is relaxed. Zipping is the same old Zipping, but I don’t much fancy nose rolls so I put the pen through Campanologist, Illustrious Blue, Buccellati and Profound Beauty. 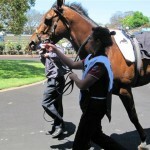 And I don’t like Monaco Consul’s combination of crossover noseband and pacifiers. Linton was kicking back in his stall, and Tokai Trick has three strappers, probably one more than necessary. Shoot Out has his head up. Descarado looks terrific, Americain is a striking horse, with what we horse watchers call “presence”, Harris Tweed looks snaky. The rain interrupts and ruins my note taking. I puzzle long and hard over Manighar and Holberg and finally decide that Holberg is too small and light to stand up to the rigours of a rough Cup. My final six in racebook order are Shocking, The Champ, Americain, Descarado, Manighar and Maluckyday. Into the tote hall, which is deserted as usual – two minutes before the jump. I back The Champ for a place. Everyone criticizes me for being boring and conservative, but $2.00 the place seems exceptional value to me about a 2/1 chance. I never have exotic bets, but in a rush of blood I box six in the trifecta. The rest is history. The Champ gets third and the trifecta pays a miserable $300 instead of $3000. But two bets for two wins on the Cup? Who would ever complain about that?